Park classification, inventory, and service analysis are critical components of the Parks Master Plan. These components characterize the existing park system and establish a framework that helps identify current and future park system needs. 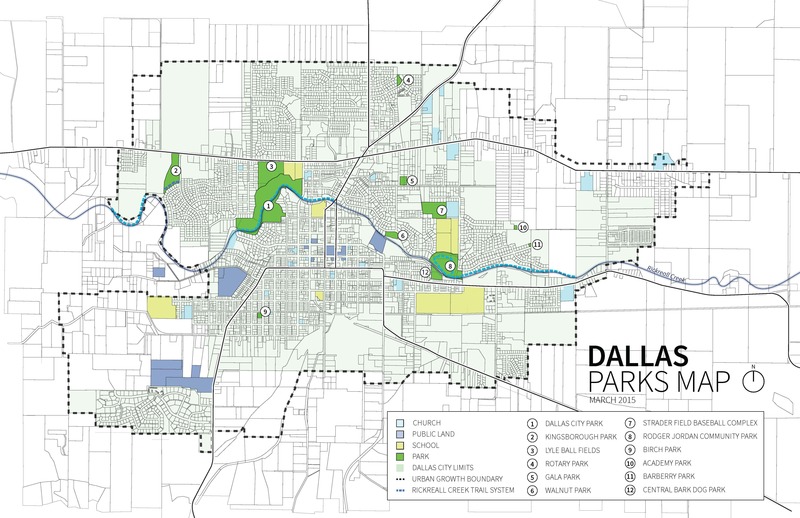 Dallas parks planning process focused on a planning area within the current Urban Growth Boundary (UGB). In total, the City of Dallas currently manages and operates approximately 91 acres of parkland. This includes 10 parks, one trail system, and two sports complexes. Click on the classifications to the left to see a definition, design criteria, and parks of each type in the City of Dallas. For a complete matrix of existing parks - including amenities, acreage, and classification - click here. The Level of Service (LOS) analysis for Dallas's park system is based on existing park acreage and current population estimates for the city. The LOS is expressed as the ratio of developed park acres per 1,000 residents. *Based on the 2014 estimated population. Level of Service (LOS) ratio = developed park acres per 1,000 residents. The basic function of the LOS is to ensure quality of service delivery and equity. The overall LOS currently provided by all parks (developed and undeveloped) is 6.12 acres per 1,000 residents and the current LOS provided by trails is 0.16. This is based on the estimated 2014 population of 14,800 residents. This ratio is currently lower the the ratio range of 6.25 - 12.5 recommended by the State of Oregon Comprehensive Outdoor Plan (SCORP). To see a complete table of LOS ratios per park classification, click here. Many cities adopt an LOS standard. This standard is a measurable target for parkland development that provides the foundation for meeting future community parkland needs and leveraging funding. This standard can be established with the intention of either maintaining the current level of service, or as a goal for an increase in future levels of service. The Dallas Parks Board recommends adopting a LOS standard that would provide a park system that includes a Neighborhood Park within walking distance (or 1/2 mile) for all local residents as well as a minimum of 6.25 acres/1,000 residents. A Neighborhood Park is typically 3 acres in size and provides amenities for both passive and active recreation; including multi-purpose lawns (minimum 1 acre in size), playground equipment, walking paths, and picnic facilities. While Dallas's park system has several beautiful and highly functioning parks, several areas within the urban growth boundary are underserved due to distance needed to travel to a Neighborhood or Community Park. While Pocket Parks can fill the gap when land is unavailable for larger parks, the City of Dallas needs to consider the addition of a significant amount of land to fulfill the needs of a growing community. The population of Dallas has been projected to reach approximately 16,651 by the year 2020 (or a 12.5% increase). To reach a LOS of 6.25 for a population of 16,651, the City of Dallas should aim to add 13 acres of parks and open space to the existing park system by the year 2020. Continuing expansion of the park system will help to reduce crowding in parks and avoid stress on parks facilities, equipment and natural resources. The City should plan to provide park facilities in underserved areas and where future residential development is expected. The areas currently underserved are the neighborhoods north of West Ellendale Avenue, south of downtown, and along the eastern edge of the City. This is not intended to prevent the City from acquiring lands in other areas if opportunities emerge; rather to focus on specific areas of need. The map below is intended to represent broad neighborhood units where parks, open space, and trails should be acquired as Dallas's population expands. This map is not mean to recommend particular lots of land for parkland acquisition.